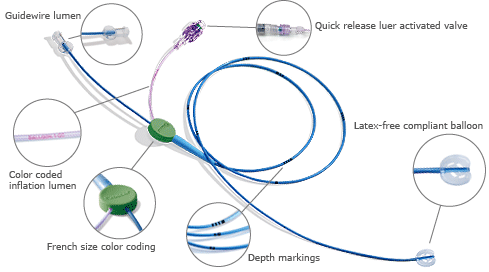 This is a double lumen compliant occlusion balloon catheter intended for the temporary occlusion of the coronary sinus during a venogram or infusion of a contrast media or a drug. When inflated, the coronary sinus is occluded and venography or drug delivery easily accomplished. The Venos® occlusion balloon catheter is available in a standard 10mm or a large 15mm diameter compliant balloon, in sizes ranging from 5F to 7F. All Venos® Occlusion Balloon Catheters are Latex Free.